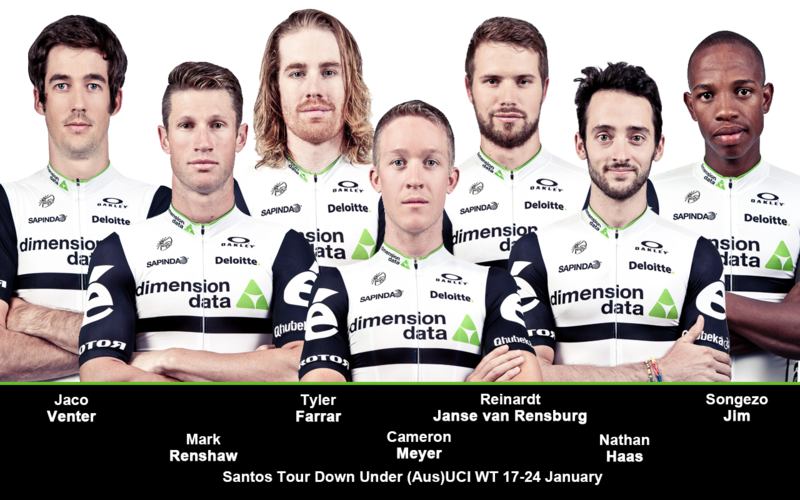 Team Dimension Data for Qhubeka will get its World Tour campaign underway at the season opening Santos Tour Down Under, which takes place from the 17-24 January in Adelaide, Australia. After Cameron Meyer, Nathan Haas and Mark Renshaw got us off to a great start at the Australian National Road Champs last week, our African Team are motivated to make an impression at our first UCI World Tour event of 2016. Once again the Santos Tour Down Under will get underway with the curtain raising People’s Choice Classic Criterium on Sunday 17 January. The stage race then officially gets underway on Tuesday the 19th, and ends after 6 stages on Sunday 24th. Stage 5 is expected to be the race defining stage as it ends with two ascents up Willunga Hill. The remaining 5 stages have options for both the opportunists and sprinters. Team Dimension Data for Qhubeka will field an exciting line-up for a debut 2016 World Tour race. All 3 of our Aussie riders will start with Cameron Meyer and Nathan Haas both prospects for a decent overall result while Mark Renshaw, particularly as he will team up with Tyler Farrar, give us options for the bunch kicks. Our 3 South African riders, Reinardt Janse van Rensburg, Jaco Venter and Songezo Jim will complete our 7 rider roster. I’m hoping to have a good week overall and the GC will be my first priority. After last week at the nationals my form seems to be pretty good and I should be up there among the favourites but I don’t think I am one of the clear favourites like Simon Gerrans, Richie Porte and Rohan Dennis. I think I can use this and look for my opportunities throughout the week. Team Dimension Data for Qhubeka was founded in 2007, steadily working its way up from a regional team to now being a World Tour team with bases in South Africa and Italy. It’s also known as Africa’s Team due to its focus on helping African talents to the world stage of cycling. The team’s goal is to raise funds to mobilise 5,000 people on bicycles in Africa through Qhubeka. To contribute to the #BicyclesChangeLives Campaign, click here. Qhubeka is an Nguni word that means “to progress”, “to move forward”. Qhubeka (qhubeka.org) is part of World Bicycle Relief (worldbicyclerelief.org), a global non-profit organisation dedicated to advancing education, health and economic opportunities by providing simple, sustainable transportation through the power of bicycles. Dimension Data is a global company specializing in information technology services. Founded in 1983 in South Africa its focus areas include network integration and security solutions among others. Dimension Data operates worldwide in more than 50 countries. All images attached to the press release can be used with the respective image credit in combination to this release.